It’s so refreshing — just lovely plain colours, bright colours or neutrals (no wishy-washy pastels! ), simple styles, no slogans, hardly any designs, and mostly completely unisex. OK, there’s one Girls T-shirt which is “especially for girls between 6 and 16 years” (and it isn’t pink! ); there are ladies’ leggings (which come in a variety of colours, including blue! ), and ladies’ tshirts (these are kind of on the pink spectrum, though there’s a black and a grey option as well), and kidsclothing has a separate section for ‘girlsclothing’ [sic] … but I’m just being picky now. Really, the vast majority of it is delightfully bright and cheerful and stereotype-free. All our clothes (apart from a few dresses) are unisex and so can be worn by girls or boys. The world is filled with colour, everything is a possibility, and we don’t intend to make that world smaller by putting our fearless adventurers into a sea of pinks and blues, clothes that look like they were meant for adults or slogans they can’t yet read! All the materials and designs we use give total freedom of movement, are as colourful as a paint-box and hard-wearing enough for daily adventures. We want our clothes to have more than one life, and most of all, we want the children who wear them to have fun. OK, if I was being really picky I’d ask them to change that parenthetical remark in the first line to “apart from maybe a few dresses” — hey, it’s fine by me if boys wear dresses! — but as a mission statement for kids’ clothes, this is basically brilliant. Their clothes are bright and cheerful and fun, with spots and stripes and animals and smiley faces; some of them come in pink or blue, but that’s fine when pink and blue are just two colours among many rather than a way of drawing a line down the middle of humanity. Tootsa MacGinty even have clothes with badgers on. It doesn’t get much better than that. The only sad thing about these two lovely sites that they’re so clearly the exception: in an ideal world I wouldn’t be able to do a blog post about kids’ clothing sites that aren’t full of sexist stereotypes, because there’d be too many to count! For now, though, I’m going to count my blessings, check my bank balance, and splash out on lovely clothes for my lovely baby. “Because girls love comfort and style, we design both into our shoes.” Comfort and style don’t sound too bad (though if I’m trying to buy shoes for my toddler, comfort is far more important than style)… but check out the colours of the girls’ shoes (you don’t need me to tell you that they’re the ones on the left of the cabinet): you’ve got a choice of pink, purple or white. That is: the ubiquitous pink; something that’s really fairly similar to pink; and something completely impractical for actually walking around outside. You can guess what’s coming next, can’t you? “Because boys test their shoes to destruction, so do we.” The colours back this up: they’re blue, brown, and black. Practical colours, colours that don’t immediately show every scuff or muddy mark. As a woman I’m immediately furious at the implication that girls aren’t expected to do anything except look pretty in their shoes (but hey, we’re allowed to be comfortable too! That’s progress!) — but the implication that boys don’t (or shouldn’t) don’t care about comfort or style is stupidly limiting too. 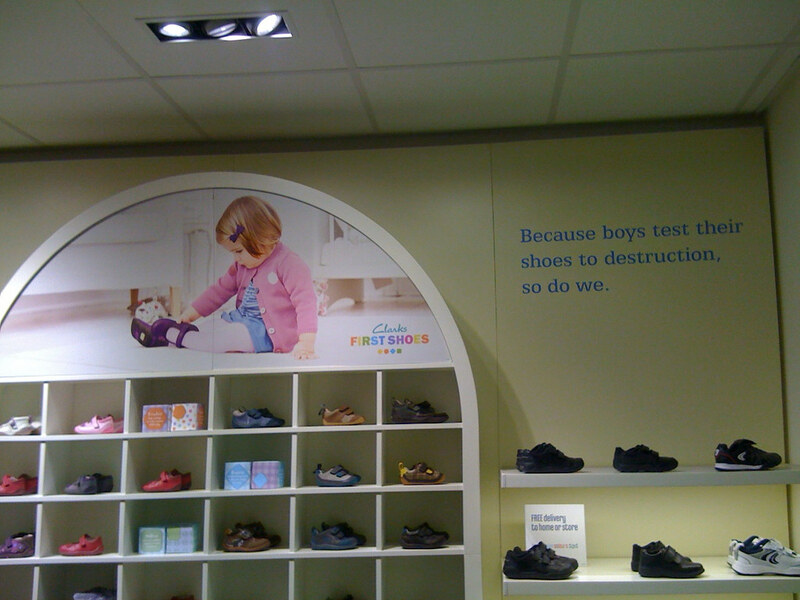 Toughen them up, it says: big boys don’t cry if their shoes hurt them; and presumably a boy who cared about style would just be beyond the pale (pastel colours). Otherwise, the main difference seems to be that boys get two velcro straps (more stability) while girls get one (more style, I guess?). 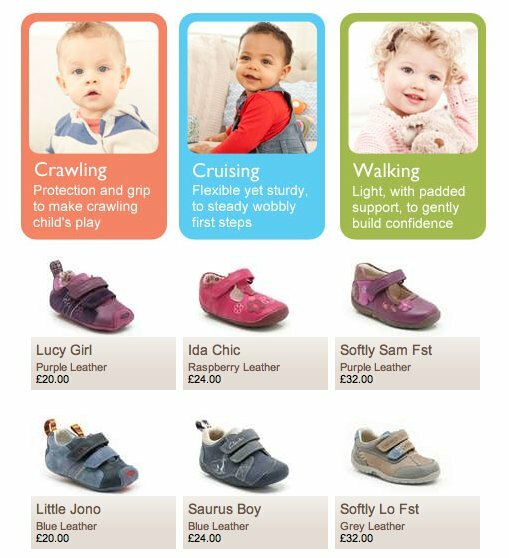 I will also note that even in the names of the shoes, girls get “Chic” while boys get “Saurus”, and girls get “Raspberry” while boys get “Blue” — see previous post for more about colour naming. comfortable and stylish shoes falling apart! stay inside with her fashion dolls? be equally durable for both boys and girls. picking an attribute of a product to market. Of course, they’ve kind of missed the point; but equally, from their point of view, it’s “just” about marketing. This is what many people say when they hear me banging on about these issues: what’s the big deal? It’s just an advert. The products are the same: it’s just how they display them. You can make your own mind up. And indeed, one company doing this isn’t a big deal; but when it’s part of the constant corrosive drip, drip, drip of messages telling girls that their role in life is to be pretty and passive while boys get to be active (or indeed, from the other point of view, telling boys that they have to be bold and brave and boisterous but they mustn’t care about their looks or comfort) … then it’s part of the problem. The other thing people tend to say is “Well, what would you say about boys’ shoes and girls’ shoes that would pass your ridiculous criteria for not being sexist?” Here’s a radical idea: don’t divide them into boys’ shoes and girls’ shoes at all. Boys’ and girls’ feet aren’t that different (and even if they were, you could sell the same design of shoes in “boy” and “girl” shapes, just as you sell them in different sizes). 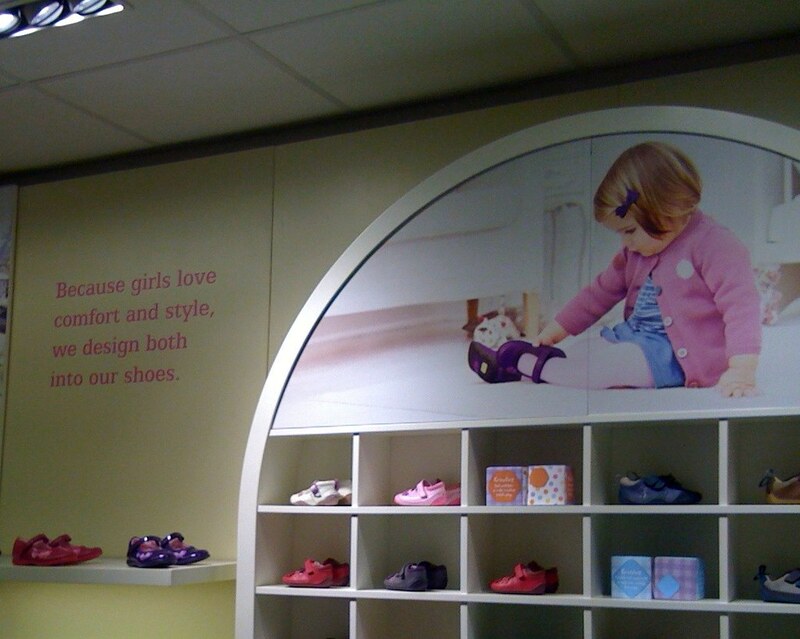 Would changing the Clarks display make a difference? No. But if the people responsible for thinking about the marketing were encouraged (or even forced by law) to work along those lines, and if the parents weren’t content just to sit back and consume as if marketing was an elemental force of nature that couldn’t be guided, tamed or curtailed…. then perhaps, slowly, things would change. Otherwise, if you want a picture of the future, imagine a blue destruction-tested bootie stamping on a little girl’s face — forever. “Click here for boys and here for girls”, they say. So where do I click if I want to browse a whole range of t-shirts and make my own mind up about which might appeal to my daughter or my nieces and nephews? Not on this site, I guess. Even worse, when I did actually look at the t-shirts, they were the same old tired nonsense: all the boys’ tshirts are blue, and feature a football, a monkey, a frog, and (OK, this one was surprising) a ‘peace’ sign; all the girls’ tshirts are pink, and are decorated with lovebirds/hearts, the slogan “little angel”, more hearts, and butterflies. I bet boy orangutans (available in RUSTY CAR ORANGE) and girl orangutans (available in SWEET MARMALADE ORANGE) don’t have to worry about this sort of thing.